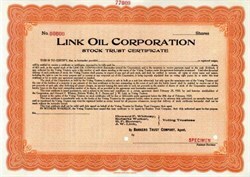 Beautifully engraved SPECIMEN certificate from the Link Oil Corporation. This historic document was printed by the American Banknote Company in 1920 and has an ornate border around it. J. W. Link is one of the Trustees listed on the certificate. LINK, JOHN WILEY (1866-1933). John Wiley Link, lawyer, land developer, and businessman, son of David Lowman and Nancy Emmaline (Henry) Link, was born near Gallatin, Texas, on December 1, 1866. He studied law at Baylor University and was admitted to the bar in 1888. In 1891 he joined the law firm of Holland and Holland in Amarillo. He married Ihna Imola Holland in 1891. He moved with the firm in 1895 to Orange, where he became mayor in 1900. During this time he was instrumental in securing the Beaumont-Orange deepwater channel. Link moved with his family to Houston in 1910 and developed the Montrose area under the title Houston Land Corporation. In 1912 he formed and became president of Link Oil Corporation and in 1921 became vice president and general manager of the Kirby Lumber Company. In 1926 he became first chairman of the board of the American General Insurance Company. He became president of the Dr Pepperqv parent company in 1929. He died in Houston on March 18, 1933, and was survived by his widow and five children.